Grease and line a swiss roll tin with greaseproof paper. 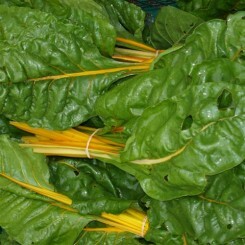 Finely chop the onion and remove the coarse stems from the spinach. Melt the butter in a saucepan and sauté the onion until transparent. 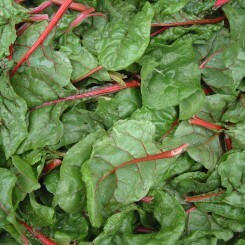 Add the spinach or chard and cook over high heat, stirring frequently, until no moisture remains. Off the heat, stir in the parsley and season generously with salt, pepper and nutmeg. Turn the mixture on to a clean working surface and chop (be sure not to puree it!). Leave to cool. Whisk the eggs and a pinch of the salt in a basin until thick and creamy, ie, until the trail of the whisk stays in the mixture. Fold in the cooled spinach/chard and the flour carefully, then turn the mixture into the prepared tin. Level the surface and bake in the oven at 200C (400F) Gas Mark 6 for 10-12 minutes until even and firm to the touch. Turn out on to a piece of greaseproof paper and roll up like a swiss roll, starting from the short edge and keeping the paper in between the roll. Leave to cool on a wire tray. Mix the cottage cheese with the chives. 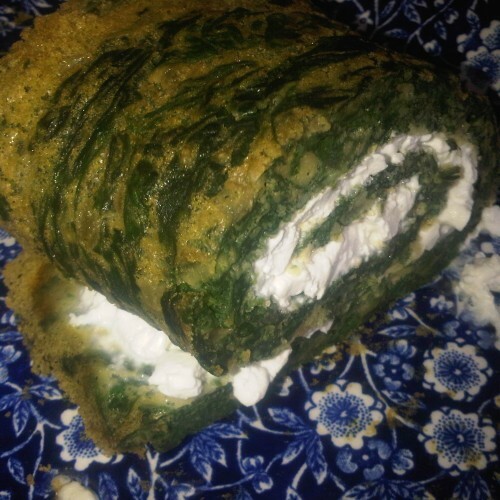 Carefully unroll the ‘roulade’ and spread with cottage cheese. 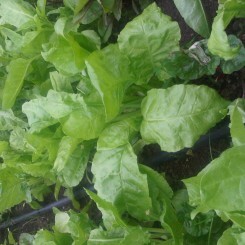 Re-roll and serve with minted new potatoes & mixed salad leaves.